According to most Jewish authorities, matzo may be ground into flour and then cooked in a soup. This follows the general principle of ein bishul acher bishul (there is not cooking after cooking). In the case of matzo, once the cooking process is completed, it cannot be cooked a second time and retains its status as non-leavened (even if it puffs up in soup). Two foundation law codes, Maimonides and the Shulchan Aruch permit the eating of matzo that has been mixed with water. The Chassidim however, took a more stringent approach to these matters. Shneur Zalman of Liadi, the founder of the Lubovitch (Chabad) dynasty, wrote a new version of the Shulchan Aruch, the Shulchan Aruch Ha’Rav. In other words, he came up with a separate, modified set of Jewish laws just for his subgroup. In it he mandated various additional stringencies and customs for Chassidim, including a ban on eating gebrochts, matzo that has been crushed (and mixed with liquid). The concern was that after the implementation of machine-made matzo, matzo was baked in far fewer than the 18 minute limit. In theory, according to Shneur Zalman’s calculations, matzo might have the capacity to leaven, even though it is technically cooked. It is possible, according to his logic, that some of the flour was not adequately mixed during the time of preparation, and is susceptible to leavening should it come in contact with water. As a result, Chabad-Lubovitch (those who follow the rulings of Shneur Zalman) do not eat matzo that has come into contact with water. They will sometimes keep matzo in plastic bags during meals, lest moisture alight on it accidentally. Oddly however, on the 8th day of Passover many Lubovitcher Jews will eat gebrokts. According to their reasoning, the 8th day is an entirely Rabbinic institution. Thus, many Lubovitch Jews, and some non-Lubovitch Chassidim will specially eat a meal of matzo balls on the 8th day of Passover. Meanwhile, the difficulty of abstaining from matzo balls is great. Many Lubovitch Jews will eat matzo balls made of potato flour, labeled non-gebrochts in stores. 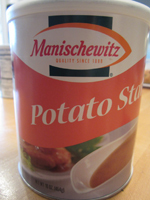 Potato flour and potato starch are both heavily used during Passover to create legally permissible dishes. The substance has a rather dubious history, and is mentioned as an unhealthy filler in the famous novel The Jungle about the origin of the industrial food industry. They had always been accustomed to eat a great deal of smoked sausage, and how could they know that what they bought in America was not the same–that its color was made by chemicals, and its smoky flavor by more chemicals, and that it was full of “potato flour” besides? Potato flour is the waste of potato after the starch and alcohol have been extracted; it has no more food value than so much wood, and as its use as a food adulterant is a penal offense in Europe, thousands of tons of it are shipped to America every year.